Sufferers are afflicted by a congenital absence of melanin, a pigmentation defect in the hair, skin and eyes that causes vulnerability to sun exposure and bright light. Many have very poor vision as a consequence and in tropical countries especially they can be vulnerable to skin cancers if unprotected from the sun. Though it might seem absurdly obvious, the point is worth stating so starkly because in parts of sub-Saharan Africa especially, albinos have traditionally faced discrimination and prejudice – innocent victims of a still widespread belief that the condition is in some way associated with the supernatural. To some, a white-skinned African person is seen as a kind of phantom or ghost, who rather than die will dissolve or disappear with the wind and rain. As a result, in some communities, albinos have been feared, shunned and socially marginalised. 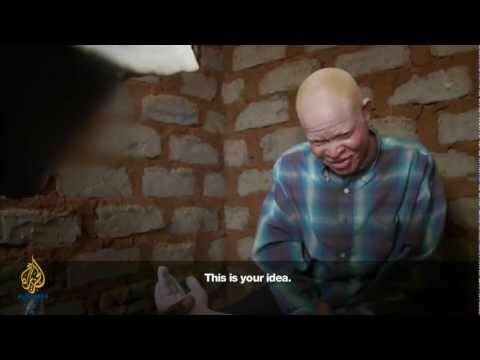 Over the last five years in Tanzania, however, the situation has become much, much worse, with albinos increasingly subjected to murder and mutilation because of a completely spurious myth that albino body parts are effective in witchcraft rituals. Despite international outrage and repeated attempts by the Tanzanian government to stamp out this truly appalling practice, since it first came to light many albinos have been hunted down and attacked purely for their limbs and organs. Indeed the incidents seem to be increasing. Since 2008, at least 62 albinos have been killed in Tanzania, 16 have been violently assaulted and had their limbs amputated and the bodies of 12 albinos have been exhumed from graves and dismembered. Film detailing the aspects of the Zodiac investigation, featuring interviews with investigators and surviving victims.